A bright inner moon of Neptune that has been missing in action since 1989 has been spotted, astronomers said Tuesday. 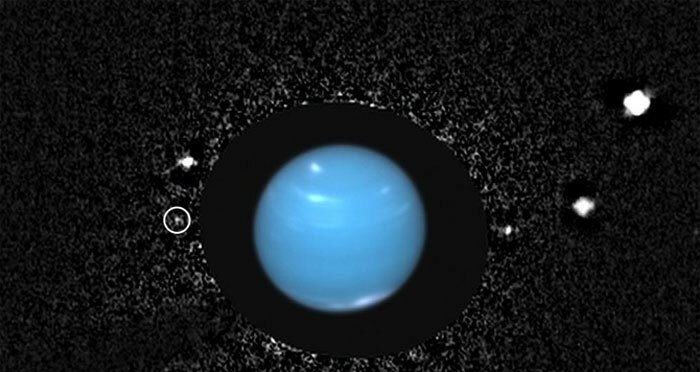 Credit for the re-discovery of Naiad, the giant plant’s closest moon, goes to Mark Showalter, with the SETI Institute in Mountain View, Calif., and colleagues who devised a new way to analyze archived Hubble Space Telescope images. Astronomers have been on the hunt for Naiad, which orbits about 30,000 miles away from Neptune, since it was discovered in photographs snapped by NASA’s visiting Voyager 2 spacecraft in 1989. “There’s a reason we had so much trouble finding it. It’s in the wrong place,” Showalter told reporters during a webcast press conference at the American Astronomical Society meeting in Denver on Tuesday. Based on analysis of Naiad’s orbit extrapolated from Voyager 2 data, astronomers had expected to find the moon about 80 degrees away from where it actually turned up in archived 2004 Hubble images. “That’s a surprisingly large amount,” Showalter said. Scientists aren’t sure why their predictions were so far off. One theory is that Naiad’s sister moons have been exercising their gravitational muscles and elbowed Naiad off the projected course. Another idea is that the uncertainties in the Voyager data were large enough to account for the moon’s unexpected location. Naiad is one of 14 known moons of Neptune. Neptune's innermost moon, Naiad, is clearly seen here for the first time since the Voyager 2 flyby of 1989. The Hubble Space Telescope captured the tiny point of light just off to the side of Neptune in December, 2004. The detection went unnoticed until recently, when the images were re-analyzed using newly developed processing techniques. The new analysis employed special processing to suppress the extensive glare around Neptune, which is more than one million times brighter than the nearly 100-km object shown. The image is composed of eight four-minute exposures, which have been combined to produce the equivalent of a single 32-minute exposure. The images were obtained by the High Resolution Channel of the Advanced Camera for Surveys on the telescope. An occulting mask was placed in front of Neptune to reduce the planet's glare. In the image, a color composite of Neptune, taken one month earlier, has been inserted for context. (1) Naiad is the encircled point of light just to the left of Neptune. (2) The orbits of all seven inner moons are indicated by blue lines. The next moon, Triton, is much further out and much larger than any of these small objects, which range from 20 km to 400 km in diameter. (3) This version of the image identifies all of the bodies visible in the image. Note that even the newly-discovered moon, provisionally identified as S/2004 N 1, is visible here as a faint dot. Only the third moon from the center--Despina--is not shown, because it was positioned behind the occulting mask, along with Neptune, at the time the images were taken. Neptune's slender rings are seen with remarkable clarity in this composite image taken by the Hubble Space Telescope. The rings were first imaged by the Voyager 2 spacecraft in 1989. Hubble obtained this image of Neptune in December, 2004, but astronomers only recently developed the image processing techniques needed to suppress the planet's intense glare and make this view possible. This image is composed of 26 individual exposures, which have been combined to produce the equivalent of a single 95-minute exposure. The outer ring, Adams, shows two distinct bright segments or "arcs" to the right of Neptune. At the time of the Voyager flyby, this ring contained four arcs, but two of them subsequently faded away. The arcs are believed to be confined by the gravitational influence of a nearby moon, Galatea, but the scientists do not currently understand why only two of the four arcs have survived for the intervening 15 years. An inner ring, Leverrier, is also visible. “Naiad has been an elusive target ever since Voyager left the Neptune system,” said Dr. Showalter. From Earth, Neptune is 2 million times brighter than Naiad, andthetwo are separated by only one arcsecond. “This is equivalent to the width of a human hair from 50 feet away,” noted collaborator Lissauer. The team of astronomers needed to develop new techniques to suppress Neptune’s glare. Naiad was finally revealed, moving across a sequence of eight images taken during December 2004.